PlotNo 305. Hebbal Industrial Area. Metagalli. 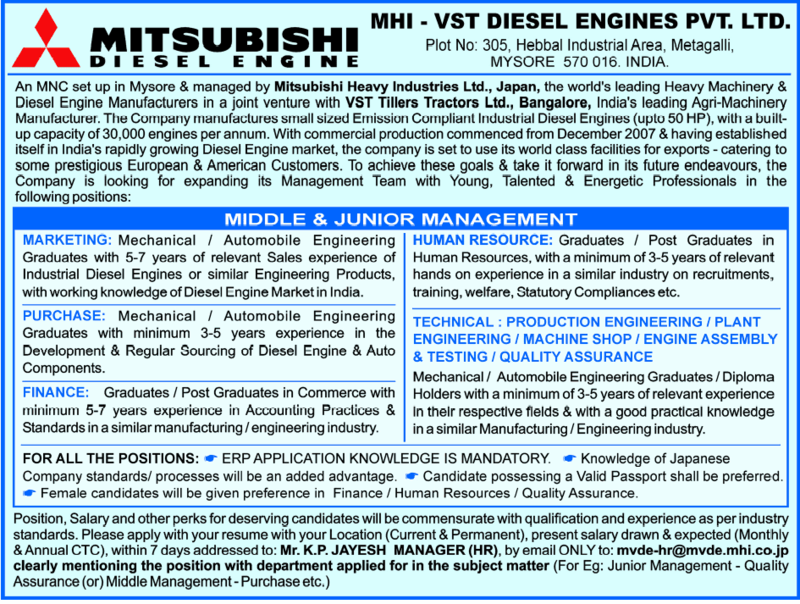 MARKETING: Mechanical / Automobile Engineering Graduates with 5-7 years of relevant Sales experience of Industrial Diesel Engines or similar Engineering Products, with working knowledge of Diesel Engine Market in India. PURCHASE: Mechanical / Automobile Engineering Graduates with minimum 3-5 years experience in the Development & Regular Sourcing of Diesel Engine & Auto Components. FINANCE: Graduates / Post Graduates in Commerce with minimum 5-7 years experience in Accounting Practices & Standards in a similar manufacturing / engineering industry. HUMAN RESOURCE: Graduates / Post Graduates in Human Resources, with a minimum of 3-5 years of relevant hands on experience in a similar industry on recruitments, training, welfare, Statutory Compliances etc. Mechanical / Automobile Engineering Graduates / Diploma Holders with a minimum of 3-5 years of relevant experience In their respective fields & with a good practical knowledge in a similar Manufacturing / Engineering industry.